Shedding the wolf: Let There Be Light! This really IS going to be the Best Year Ever. For sure. This blog does not contain advertisements, and this author has no idea whether there are cookies lurking here, so some links might include cookies that I don't know about. By clicking on a link you are agreeing to the use of those cookies, if they exist. Back nearly where I started, with no job and no direction. It is time to re-assess, decide what is good and should be kept in my life, and which bits have served to teach their lessons and can be left behind. The 'work stories' contained herein are not biographical. The lessons learned from them are true, but the names and identifying details of patients and families have been changed for purposes of confidentiality. In other words, the stories are true, but the people are not. And, because it has to be this way (by law), any resemblance between them and real persons is coincidental, or maybe just evidence that we are all, after all, very much alike. 1. Meet more people; Invite new guests into my house. Result: I'm giving myself a Passing grade on this one √. a. attempt #1: invited neighbors to come over after they indicated an interest in shelling and a curiosity about my shells. They declined, saying they hated to leave their house, and suggested I bring the shells over some time. b. attempt #2: same neighbor came to door and invited me to take a walk. I invited her in, but she came only as far as the entry way. After our walk, I re-invited her in. She hesitated, and then said she'd like me to come into her house instead, so I went for coffee. c. attempt #3: postponed until I clean up! What a mess! d.my neighbor finally came over and had a glass of wine -- right before telling me they were moving that weekend! e. making things even worse in my dismal social situation, I ended my odd relationship with Dr. Cranky. He finally insulted one too many people I care about and something snapped. But it shook me a little to realize that he was the only non-relative, non-work, non-out-of-state, non-cyber 'friend' I had. Pathetic. 2. Make a plan to have some social contact on my non-family holidays. 3. Consider a pet, but try to resist! Remember that travel is more difficult if you have a critter to consider. a. Hmmmmm. My son told me last week that they will watch a pet for me when I travel and that I should get one if I want to. I wonder what he could be trying to tell me? Result: I'm giving myself a Passing grade on this one √. I resisted, and I'm glad I did. I hope to get a lot more travel done before I tie myself down. 4. Try yoga, once a week. a. attempt #1: looked into low-cost class offered through work, was warned that it's a talkative (not meditative) class. Not what I had in mind. Plan to look elsewhere. Found out there is an inside track where I can walk for free. Plan to look into that as an alternative. b. didn't do yoga. didn't walk. Result: I failed at this until the last two weeks, and I've walked for 20 days in a row since the first of the year, a minimum of a mile a day. I may have failed in 2012, but I'm happy with my progress anyway! 5. Weight Watchers at least monthly. a. Went in January. Sad face. b. Went in March. Good grief, very sad face. c. Didn't go in April or May or June or July or August or September because the situation is only getting worse. I believe this is what they call a slippery slope. Result: I failed at this, but I lost ten pounds anyway. I'll take it! 6. Fish a few times, go to the Fly Girls retreat, start tying flies again. a. Went to a February FlyGirls retreat -- learned a couple of new knots and met some nice people. b. Tied flies with a group class for several weeks. c. Went to a weekend fly fishing class in June and had a great time, but was exhausted! Fished a couple of times with my brother and caught 2 little bluegills. d. Meant to go fishing again by myself, but didn't. Result: I'm giving myself a Passing grade on this one √. I didn't fish as much as I'd hoped to, but I improved my skills. 7. Target shoot - try for twice a month; go at least monthly. a. (January, went to shoot twice; February went once; March, no; April, no; May, once for pistol, once for shotgun. Getting back on track, maybe -- shot twice in October, but then shot a lot since then, and have plans to do more. Result: I'm giving myself a Passing grade on this one - √. Result: I get a Failing grade on this one - maybe next year. 9. Get the schedules for Crow and World Cafe. Go to at least one event at each. a. Dismal failure. I drive by the Crow almost every day. I wonder if I'll ever stop? I'm giving myself a Failing grade on this one - maybe next year. 10. Do something memorable with the kids. a. April - Disney World with family! Definitely memorable! 11. Take a vacation with my sister. a. We went to the west side of the state for a couple of days, and took a short in November. 12. Go to New Orleans to visit. a. Went on an unexpected trip there in March. Not the trip I had hoped for, but I was there. I've been looking into another trip, but haven't found a date yet when both air and hotel are reasonable. Result: I'm giving myself a Passing grade on this one √. I'm not always responsible for how a trip goes. a. Found two! In New Orleans. b. Found two in Michigan. Result: I could have done better, but I'm giving myself a Passing grade on this one √. 14. Crafty stuff -- are there lampwork classes nearby? Knit at Barnes & Nobel? Any are better than none. a. Learned to crochet, learned to quilt and learned to make lampwork beads. Made a couple very cute fairy houses, and am working on a quilt hanging for work, and made an applique quilt for my brother. I'm knitting scarves, made a couple of cute coin purses. 15. Seriously. Clean the basement. a. Found evidence of mice in basement. Cleaned off one counter and vacuumed one area. 16. Really seriously. Get rid of stuff I am not using. 17. Set up a potting table; reassess what to plant in this year's garden. 18. Learn to scan photos. Scan Rome photos, old family pictures. a. Scanned the Rome photos, and need to set time aside to get through the many bins of photos in the basement. Result: did it, but have a ton more to do. Partial credit. Result: I did save more, but I'll have to do better this year since my furnace is on the way out . . .
20. Follow a gift budget. Result: I'm giving myself a Passing grade on this one √. I spent more than I should have, but I kept to the budget -- I just made it bigger than was smart, lol. 21. Snorkel with turtles. Or belugas. Or both. Result: Didn't, but this was a long shot for 2012. Maybe next year. 22. See the northern lights. 23. Find more sharks' teeth. Result: Found a good handful in November so I get a Passing grade on this one √. 24. Get a new profile picture to update the one from last year. Result: Forgot all about it. 25. Be open to new ideas. Result: I learned so many new things in 2012, so I'm giving myself a Passing grade on this one √. 25. Be open to new relationships. Result: I let a friend introduce me to the man she thinks will be Perfect for me. He apparently didn't think so, but I am glad to have met him, and glad to have tried. I'm giving myself a very happy Passing grade on this one √. After spending over 22 years as a research attorney for a governmental unit, I became unexpectedly unemployed. In the process of reinventing myself, I moved to a new city, learned to shoot and fish and took a job as a chaplain. I can't wait to see what comes next! The 2011 LIST: 61 Things to Do Before I'm 62! √ Write more letters - doing well, could do better. In that same vein, catch (and release) a decent-sized fish! Check out the local concerts. √ Take a vacation with my sister [February, check]. Make a pair of earrings. Invite someone who isn't family into my house. √ Learn/do something I've never done before [tiaras; beaded tableware;]. Make a map-collage on the wall in the twin guestroom. Put up a potting table. √ Hang something on the living room walls [poster, check]. Downsize my possessions, get rid of things I am not using. Clean and organize my freezer. Add to the list as a bonus item -- SWIM WITH TURTLES!! I won the coolest prize from Kelly at I Have A Notion and it arrived today! 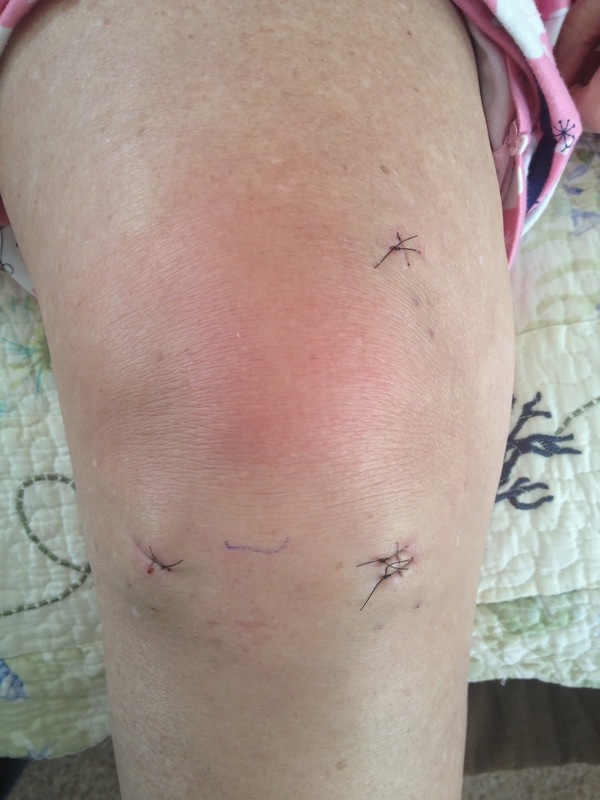 A little back story -- this week I was with my sister while she recovered from knee surgery. I was there to help for a few days with food and meds and ice and the usual oddments that a person who is supposed to rest might need. But I had a lot of time to sit quietly, too. So I kept busy with a variety of things, including search and rescue research, letter writing, and crafts. 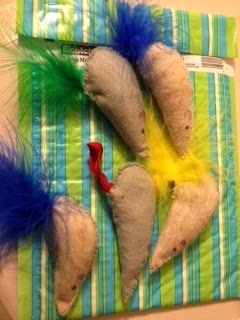 I made some adorable catnip mice with rick rack or feather tails. I also worked on the endless scarf I am knitting. I kept the lights low to avoid disturbing my sister and as evening fell, I had a hard time stitching and knitting. More than once, I dropped stitches and had to huddle under a lamp trying to salvage my work so that I wouldn't have to frog the whole thing. Which leads to the prize I won on I Have A Notion and received today. A Beam n Read light from ASF Lightware Solutions. I love flashlights, but this light is especially cool. It has a choice of 3 or 6 LEDs, depending on how much light is needed, it has a strap that I can put around my neck so it's HANDS FREE. If that weren't enough, it also has a built in magnifier and two filters, one for softer light and one for night vision! And all this coolness runs on four ordinary AA batteries. So I couldn't wait to try it. I got out my knitting, and of course I always have AA batteries in the house . . . . except for today. I seem to have used the last ones in my flameless candles. I was SO disappointed, but I'll light it up tomorrow. I have so much hand-sewing and knitting that I put down later in the evening when it gets too hard to see. I can't wait to put this little helper to use! Looks like a great product. I have a head light, meaning it goes on my head. I like it but it gives me a hat head. Congrats on winning that great prize. I know it will come in so handy for working when the lighting is not good. Very cool - nice win!! I'll go check out her blog too. I am delighted you won such a useful and awesome gift. I from reading this post I can tell u need it for your projects. Been trying to visit you for a while now but google kept giving a weird message and I was worried that you had quit blogging glad that you have not. I miss blogging but my computer is so bad now when it comes to downloading big sites.